The Andhra Pradesh Public Service Commission, APPSC has releases released notification for 400 lecturer posts in Government Polytechnic Colleges (Engineering and Non-Engineering) in the technical education service of the state. 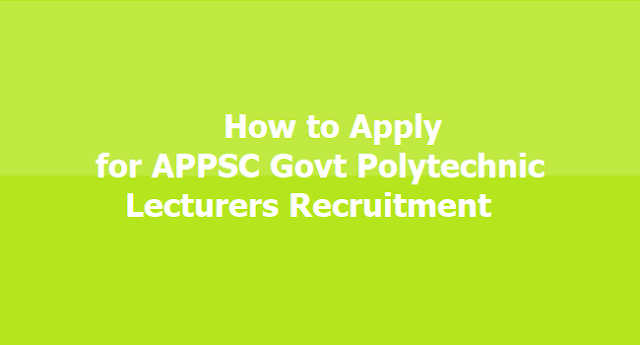 Interested and eligible candidates can apply for the posts through official website of the Andhra Pradesh Commission- psc.ap.gov.in. APPSC has opened a total of 405 vacancies out of with 95 are carry forwarded and 310 are fresh vacancies. The online link for APPSC Group 2 posts will be activated from February 6 to February 27, 2019. But the last day to submit the application form online is February 26, 2019. If the subject wise applicants exceed 25,000 number, APPSC will conduct a screening test in offline mode and the main exam will be conducted online for candidates shortlisted for the screening test. Tentatively the main examination in online mode for candidates selected in the screening test will be held through computer-based test in the month of July 2019. Applicants need to apply for the post using the OTPR user ID through Commission’s website. The applicant is required to visit the Commission’s website regularly to keep herself updated until completion of the recruitment process. The Commission’s website information is final for all correspondence. No individual correspondence by any means will be entertained under any circumstances.